Author: Ronny Meyer. Series edited by: Wilhelm J.G. Möhlig, Bernd Heine. Zay is an ethiosemitic language and therefore belongs to the Afro-Asiatic branch. It is spoken in Ethiopia at the five islands of the Lake Zway, but also on the shore and the surrounding mainland. The population census does not count the Zay people as one autonomous speech community, so the number of speakers is somewhat difficult to tell. It is estimated at up to 14,000. The Zay do not have a mythological founding father, but were formed through numerous assimilation processes of different groups. According to their oral tradition the Christians played an important role in their history, and today the Zay are still characterised by their ethiopic-orthodox Christianity. The Zay are almost exclusively multilingual. They speak Oromo because of the closeness to the people and the fact that this language is the official, and school language. They also speak Amharic which is an important lingua franca. This grammar is based mainly on the field research of the author from november 1998 until august 1999. It is classified into four main parts, phonology, morphology, syntax and discourse, followed by some language examples. The aim of the author is to document this language, but also to make new data available to the general and comparative linguistics. This is a very solid description with a lot of data. Practically this is one of the best descriptions of an Ethiosemitic language in general. 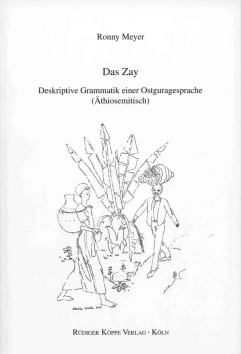 [...] Let us hope that the author will publish his collection of Zay texts with a vocabulary. [...] let me state at the outset that in these two volumes on Zay and Wolane, we have the best and most complete grammatical studies of any Gurage language to date. It is probably not an exaggeration to go further and say that these offer the most complete descriptions of any modern Ethiopian language outside of Amharic. [...] With these two volumes, Meyer has made a very valuable and sizeable contribution to the field of Ethiopian Semitic studies, to the field of Semitics in general, and to the field of linguistics in general. There are many interesting phenomena to be found within these volumes, some of which have yet to be explained. An example would be the definite articles of Zay and Wolane, which seems to correspond to the 3ms verbal object suffix. It is hoped that Meyer and others will continue to tackle those other Ethiopian Semitic languages that still await adequate description.